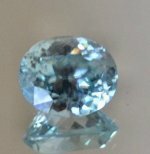 Zircon, light blue, 1.76ct., oval, EC, ~5.7x7mm, unknown locality. Zircons, light blue ovals, EC, Asia. 1.30 ct; 1.36 ct; 1.60 ct; All at $30/ct.